As of 2012, the Middle East’s Christian communities are in wide retreat. From a population of about 1 million in Iraq before the US-British invasion, half have fled the country at some point since the war started and a great many have not yet returned. In Lebanon, the formerly majority Christian community has mostly emigrated. There are about 4 million Lebanese in Lebanon, maybe a third of whom are Christians. 15 million Lebanese live abroad, and virtually all of them are Christians. Other communities are in flight, including Palestinian Christians, whose numbers around traditionally Christian Bethlehem have extremely thinned out. One reason is Islamic militancy, another ethnic relations breaking down, and then the breakdown of political and economic stability. In Egypt, some have fled since 2011’s revolution, but most have not and probably never will. Here’s why. Egypt’s Christians constitute the biggest Church in the Middle East. In a country of 70 to 80 million people, they take up about 10 million. Only the richest have fled to communities abroad in more affluent places like Brooklyn or Queens, New York. In general. Egyptian Christians have a much stronger connection to Egypt than the other communities. Even if they didn’t, they would have fewer places to run. None of the countries around Egypt have both the space and tolerance necessary to host a massive amount of Christian refugees. But the situation in Egypt is not one of civil war. The large Christian community makes an impression on the political environment. Think of how the staunchly Shi’ite Hezbollah advocates (publicly) for tolerance of the extreme diversity in Lebanon (big communities of Christians, Sunni Muslims & Druze). That is also true in Egypt, where the community’s numbers give it recognition from significant Muslim leaders – political and religious. Additionally, the community is highly organized on the religious level. It has one of the oldest churches in Christendom. The name “Copt” comes from another version of the Greek name for the country & is directly related to the English word “Egypt.” The Church also has direct influence over national churches in Israel, Ethiopia & across Africa. But the religious strength of the community dwarfs its political activism. It’s a problem that’s become acute since the Egyptian Revolution, as Islamist politicians have risen rapidly to the front of the electoral pack. Over 70% of Egypt’s new parliament comes from members of the Muslim Brotherhood and more fundamentalist or Salafi groups of Muslims. Calls for more influence by Islam in a new constitution are adding immeasurable pressure on the Coptic community. Arsons have mostly been outside the capital. Other spates between Christians and Muslims include marriage issues. While intermarriage is a massive problem for any minority, particular incidents in 2010 purportedly had a Coptic priests’ wives leave them to convert to Islam. Those set off back and forth barbs between communities, as to whether the Muslim view is right or the Christians’ view that she was coerced into converting. The truth is rather elusive. Incidents like this have become absurdly common and underscore the tensions happening in the cities between the two communities. There have been a number of holiday attacks on Christians in the last few years. In 2009, Muslim shooters killed Christians 4 people the day before Easter. In 2010 and 2011, there were attacks in January that killed about 20 combined, one of the attacks being a bombing of an Alexandria church on New Year’s. Many Copts are resistant to the idea of getting more involved in politics, but many have already started go that way. The numbers of active Christians are low, but pressures on the community have stirred debate about needing to be more aggressive or at least pro-active. Copts have the largest Church in the Middle East and might be able to play a leading role for other Mideast Christians at a time of massive flight from their home countries. Only the Church leadership has played a significant political role in years past, and the choice of a new Coptic Pope later in 2012 (writing before the selection process begins) might lead to more or less involvement by Copts in the country’s politics. For Easter 2012, Egypt’s Coptic Christians had an opportunity they formally hadn’t had in decades – visit Jerusalem. Pope Shenouda III (who? ), the leader of the Coptic Church (20 million+ members worldwide), passed away last month. In addition to his being a significant religious figure, the late Pope also banned Copts from making any pilgrimage to Jerusalem as so long as it was considered occupied. But his recent death has marked an unexpected shift for Egypt’s Christians and maybe Israel’s diplomatic opportunities around the Nile. Copts have unprecedented pressures in Egypt: a revolution’s new wave of violence against Christians; Islamists’ election victory; and now, their spiritual and de facto political leader’s demise. At the helm since 1971, it is a tremendous power vacuum. Simultaneously, Israel’s link to Egypt is fraying and the country has no social traction with the Egyptian on the street. So, the Copts of Egypt should be a vital concern for Israeli diplomacy, and electing a newer Pope should certainly have some bearing on where either side goes in respect to each other. The idea of leveraging minorities in neighboring countries is often a fantasy of Israeli commentators or enthusiastic politicos who can’t resist thinking of ways to make Israel’s security more solid. But it’s hardly unprecedented. Innumerable resources were poured into Iraqi Kurdistan pre-Yom Kippur War to pressure the Baath Party, and Israel was quick to align with the Catholics of Lebanon in 1982. Extending these policies to Egypt would be seeing an Egyptian Christian minority have controlling votes in a new parliament and blunting the political blades of Islamists in government. But it’s tough to tell if Egyptian Christians really would hold any measurable or favorable sway on their country’s foreign policy if they were to become more politically organized. But this latter event is a prerequisite to any significant amelioration of the relationship between Egypt and Israel. A new Pope already has more pressing concerns, like keeping open the opportunities the revolution has given and defending the community against ethnic and religious attacks. Israel has plenty to talk about with a new Church leader: priority among them would be the dispute over Coptic Church property in and around Jerusalem. Even if Israel does recognize, negotiate with and reach a deal over disputed spots in the holy city, that doesn’t translate into good will between Israelis and Copts on a general level. And even with a maximum outburst of positive emotions, Copts’ physical security (that is, their own preservation) is the overwhelming priority. But taking the diplomatic path with a reinvigorated Church could bear unexpected fruit. At the onset of Hosni Mubarak’s power, the Coptic Church has been relatively independent. All it and the late Pope Shenouda III had to do was support Mubarak or stay out of his way. The side-effect was an uninvolved Coptic community, grossly unprepared for the better organized and experienced Muslim Brotherhood to win post-revolution seats in the parliament in December. Standard along with that, Shenouda III always toed the line on the social climate regarding Israel – before Mubarak, he vocally opposed Sadat’s normalization with the Jewish State. It doesn’t stop there. Isolation is a tempting strategy in the Middle East, but what comes with it is letting enemies encroach on what minimal boundaries you have. An aggressive minority would have a better chance of defending its interests, and Copts should be initiating their own political parties, matching Islamist political enthusiasm and distinguishing their views from the Muslim Brotherhood. The community gains a sense of direction beyond politics with a well-defined platform. Fearing a similar result in the next elections, some vibrant counterbalance to Islamist politics isn’t against the interests of the Egyptian army. Relations with Israel are a political issue, not unlike how Americans debated ties to Napoleonic France. Coptic authorities also dispute property in the Old City that Israeli police handed to a different Church in the early 1970s. These issues are probably interrelated. Resolving one would unbind the other. While Israelis consider gestures for the next Pope, he’ll in turn have a chance to solidify a political stance and philosophy being engaged with Israel. Shenouda III was not John Paul II. But therein might lay a solution to the Church’s problems. In a broader scope, it works in defining the Coptic Papacy as a socio-political pillar in Egypt and the Arab World. tandem with promoting ethnic and religious harmony across the Middle East. Being an outspoken advocate for the fortune of Arab Christians will work well in tandem with promoting other causes for coexistence in the Middle East. But ultimately, Copts will weigh the benefit versus the cost of being more open to Israel. In today’s climate, they might be inviting more pressure from Muslim Egyptians. Israel’s options for facilitating the reputation of such a man are limited, but probably more from a lack of imagination than ability. It would be in their interest to open a new chapter with the Church beyond traditional political issues and foment an alliance. Israel should facilitate a leader that can stabilize a shaky fault, and tremors in the Coptic community imply an opportunity to do just that. Anything Israel can do overtly and covertly to facilitate those mechanisms and developments ought to be a priority. It can change the calculus in Egypt and balance the equation across the Sinai. Reporters, analysts and even some progressive Rabbis have made literary-styled allusions to the Pharoahs of Egypt and the Hebrews’ Exodus in light of the 2011 Egyptian Revolution. I’ve personally found the comparisons either to be token or hollow. It is not necessarily because of the invokation of religious heritage on the revolutionary tidal wave hitting the Arab World. However, there is an importance distinction between the two events worth describing here. By defining that contrast, we can understand what comparisons are right to make. THIS REVOLUTION BELONGS TO EGYPTIANS. The Exodus does not. From a national or an ethnic perspective, the Hebrews were able to leave the dominion of a foreign power. Even from a religious perspective, which arguably can be said to be in the merit of Muslim Egyptians, the demands Moses made of Pharoah were explicitly for the freedom of worship for the Children of Israel in the Sinai Desert. That is to say, the “Revolution” of the Hebrews projected a freedom of worship for the Hebrews through which Moses never directly stated to Pharoah the Hebrews would permanently abandon their enslavement in Egypt. Moses, Aaron and anyone else privy to the statements of God as written in scripture, knew that the statements to Pharoah were merely a front and that the liberation the Hebrews would experience was a freedom to worship in their own country. While the implications of the above paragraph allude to greater issues of freedom of worship and even the freedom to be obligated to that worship, they constitute a completely different topic. For Egyptians, the oppression they face may only be akin to the economic depravity of the authoritarian Mubarak government. However, Egypt is their country, while Egypt was not the possession ofthe Hebrews. Economically, Egyptians (as well as Tunisians and other Arab peoples) live under the remnants of Arab nationalist socialism. Socialist policies, in this case as defined by Egypt’s 40-year-old constitution and reaffirmed by the country’s Supreme Constitutional Council (supreme court) on several occasions, limits and deprives economic rights. In this respect, with the constant adherence to arbitrary policies about business licenses, Arabs could be “enslaved” to their governments. An Al-Jazeera-published editorial by Tikkun’s Michael Lerner makes the comparison. He expressed a Jewish identification plugged into Jewish experience with slavery in Egypt. But I have to say those words were not meant for the Jewish public, but the Arab public. They were not the wrong thing to say, but they were words of diplomacy and not words of ideology and assuredly not theology. Our Jewish theology takes pains to sever the connection with Egypt, despite the fact Jewish communities have periodically redeveloped there: the alternative temple in Alexandria, the centering of Rabbinical greats such as Maimonides or the Radvaz, and the extant community that fled in the 1940s. Maimonides himself identified himself as a sinner for “going back there” to Egypt, in contravention of the Biblical directive. BUT THERE ARE diplomatic words worth reaffirming among ourselves. The words of the aforementioned editorial were window dressing, a facade and surface structure. The proverbial deep structure gives us Biblical versus to respect Egyptians (after a gap of several generations removed from the Exodus) precisely for their initial kindness to allow or ancestors to dwell in Egypt to escape regional famine (decades before being enslaved). Egyptians are not relegated to the category of “those whose welfare you shall not pursue:” the Moabites and Ammonites. They are permitted, in a liberal reading even invited, to join the “congregation” of God conceived in the Sinai Desert and implanted in our own country in Israel. EGYPT’S REVOLUTION IS SIGNIFICANT FOR THEM. The significance to us of their revolution is very different; it is strategic, implicative and political. Their liberation is constituted by economic, democratic and expressive freedoms. It contrasts with our Exodus in that our freedom was religious, the right to own property and dwell freely on our own land. The socialism they will presumably roll back envests all financial power in the state and will consequently disseminate to individuals in Egypt. For us, as the Biblical verses state, the freedom to reclaim our own landed property was given to us as a matter of law forever, turning over from its renters to the original owners on a 50-year-cycle. Our freedoms were dictated by God and provided in the context of his religious worship. Egypt will have to decide how much of a role God will play as they redraw their consitution and reapply the mixed interests of liberal democrats and Islamists. If we are going to identify with Egyptians in their revolution, it is yet to be defined beyond a possible Biblical permit to seek their welfare. We could come to define a list of mutual interests. They might constitute democracy, the balance of religious obligation with personal freedom, and the balance of communal interests with the desires of an individual (another priority for Egypt’s Supreme Constitutional Council). MODERN ISRAEL AND MODERN EGYPT (and for that matter modern Iran) may be seen in a wider, even if schitzophrenic, attempt to implement democratic principles in religious governance and religious principles in democratic governance. Israel has obviously taken a very different approach than Iran, whereas Israelis only see civil religious rule and on a limited scale, while Iranians experience a harshly interpreted version of religious law applied across their legal spectrum. 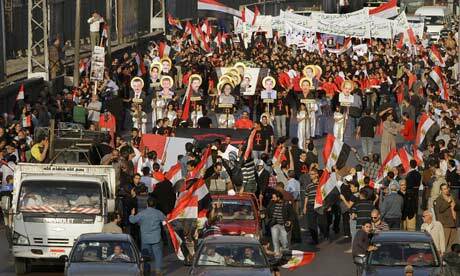 Egyptians face choices in jetisoning Western priorities in law and following the direction of Iran. Or they could follow the Israeli arrangement that allows civil theocratic intervention. Or finally, they could conceive a newer advanced concept of Islamic or religious constitutionalism (which could have consequences for how Religious Zionists conceive the possibility of expanding religious influence on Israeli law). BUT THESE ARE CONSEQUENCES OF THE MODERN AGE and do not at all come out ofphantom parallels between the Exodus on the 2011 Egyptian Revolution. There are a lot of interests that come up for both countries from this intellectual exercise, though it should be obvious the ancient liberation of the Hebrews was something apart from the recent liberation of Egyptians. But the message to Arabs in Al-Jazeera was right to be sent, not for its content but for the fact it shows valuable support for their endeavors. Its statements about contemporary politics (and specifically about the Israeli-Palestinian conflict) cannot truly speak for all Jews, but it is much better than nothing. there is an opportunity here to create a true dialog between Israelis and Egyptians not present during the rule of Mubarak. May a free press flourish there that lets us communicate with the Egyptian street once impossible, and let our identification with Egypt become real and also mutual. Prime Minister Netanyahu is categorically wrong in his approach to the Egyptian protests, should never have agreed to military reinforcements’ deployment in Sharm el-Sheikh the week of the uprising, and risks manufacturing the very scenario the Israeli security establishment fears would result from an Egyptian revolution. The 1979 Iranian Revolution is, and no doubt should, shape Israeli and American policy as it is quickly drawn up and implemented vis a vis 2011 Egypt. The united States, after a stumbling start, has positioned itself as the biggest supporter of the demonstrators in the world. 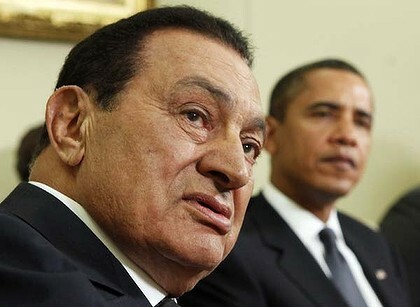 The administration does want to be associated with Mubarak as Jimmy Carter was associated with the Shah. Israel has diverted sharply from this position, and been much more extreme its flip-flopping. Israel’s anxiety about the Islamic Brotherhood is guiding its policy, a position that hinged its practicality on the realistic possibility Mubarak would hold on to power. The Israeli approach, at this point, is far more precarious than that of the Obama Administration. Buffered initially by calls from other Middle Eastern powers like Saudi Arabic to urge a cautious transition in Egypt, the direction of Saudi Arabia’s response to the American stance reduces Israel’s options. Saudi Arabia is now opting for a diplomatic opening with Iran, showing a glaring divide between the US and Saudi Arabia. Any flaring hope Saudi Arabia and Israel would be on the same page has, again, been dowsed. At this point, the Netanyahu government has to do damage control for its reckless statements early in the process. Initially smart enough to order ministers to keep quiet, it was Bibi himself that dropped the verbiage that angered Egyptians and made Israel out to be a supporter of authoritarianism. Without a sharp and unequivocal turn in Israeli foreign policy, it could find itself isolated from Turkey, Saudi Arabia and Egypt (even if all three countries turn out to be rivals). As the US aims to move in the opposite direction of its 1979 reaction to Iran’s revolution, so too should Israel consider a counter-intuitive approach. As Ayatollah Khomeini disembarked in Iran after a long exile in Iraq and France, the former president of Syria, Hafez al-Assad, was sending congratulatory messages to the revolutionary leader. He followed up his diplomacy consistently, and offered his congratulations again when a referendum passed the new constitution of the Islamic Republic. This approach seemed to have been beyond awkward. Syria was then ruled, as it is today, by the Baath party. The Baath is a secular, Arab nationalist party influenced by the socialist doctrines propagated by the Soviet Union. It had the same ideological position as the Iraqi Baath party of Saddam Hussein. In 1980, Hussein invaded Iran, fearing a stabilized religious regime would encourage Iraq’s own Shiite population to revolt (in response to Iraq’s invasion, it made that a cornerstone of Iranian strategy when Iran invaded Iraq in 1982). However, the Syrian approach was motivated more by its regional isolation and strategic pessimism than by its ideological positions. As of 1979, Syria was for various reasons isolated in the Arab world. Egypt under Anwar Sadat was concluding a peace treaty with Israel. Egypt, Saudi Arabia and Iran were consolidating a strategic alliance supported by the United States. 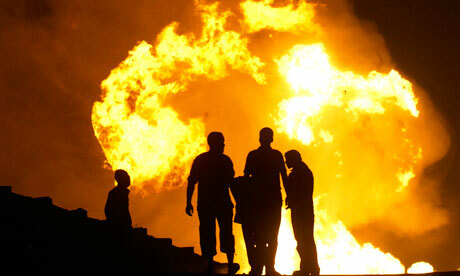 Iraq had cut off its oil pipeline to Syria. Israel circumstantially faces a similar sort of isolation. For whatever reasons this may be happening, its isolation from Turkey, the still dormant relationship with Iran and the weak relationship with the Egyptian people as of now signal an even heavier dependence on the United States than ever before. Even more acute, the frozen relationship with the Palestinians and lack of exit strategy from its occupying position in the West Bank leave the country needing a new outlook on its surroundings, policies and outreach to its neighbors. It will take more than a cosmetic change to lift the country’s position in the region permanently. 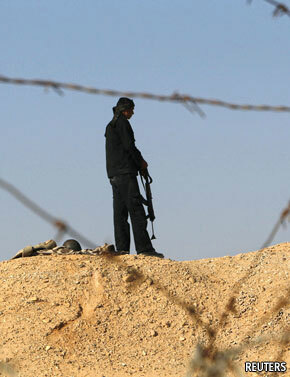 Israel can secure its treaty with Egypt and more by supporting the revolution to the utmost. Concerning Israel’s relationship with the United States, it makes the need more acute. Supporting civil rights will go much further for Israeli security than aligning with the tyrannical forces of Hosni Mubarak or his Vice President Omar Suleiman. Egypt has no reason to rebuff reinforcing its ties to Israel, and that’s a line that ought to accompany a vocal support from Jerusalem for a democratic Egypt. Israel has the ability to protect a new Egyptian government from Saudi and Iranian intelligence. It can address the country’s burgeoning water crisis by offering desalinization technology in abundance. Israel also has rising ties with African states along the Nile, positioning itself as a mediator between those countries and Egypt. There are other opportunities as well. From the side of how Egypt’s policies might change, Israel should see this as a chance to foster an array of parties, including long precluded minorities, that would diversify Egypt’s political outlook. The Muslim Brotherhood hardly has a monopoly on Egyptian political philosophy. In fact, Coptic Egyptians may provide an avenue to rekindle relationships between Israel and the Middle East’s embattled Christian populations in Lebanon, Syria and Iraq. Most importantly, near and long term, a successful Egyptian revolution will increase pressure on Iran. The demonstrations in 2009 are still fresh in the minds of young Iranians, who are watching with envy the fall of autocratic regimes in Tunisia and Egypt. As I write this, Iranian opposition figures are very publicly trying to start a new round of demonstrations in Iran. A democratic flowering there would alleviate the strategic adversity Israelis face in the Middle East, no matter what government would seem to take power in Tehran. Be it rhetorically, but all the more preferable in reality, Israel should embrace the path of democratization and publicly congratulate a new Egyptian government and the Egyptian body politic in its successful efforts to advocate nonviolent change. Let a revolutionary new approach to Egypt characterize a broader strategic mindset on the part of Israel’s foreign ministry. A revitalized relationship with sub-Saharan African and Nile Basin countries would also balance out Israel’s ties with Egypt, or turning the Tunisian and Egyptian uprisings into lightning rods for Iranians. An Egyptian revolution in no way has to constitute the threat Iran’s 1979 revolution did. Indeed, it would be the paradigm for a 2011 revolution. Israel can enable the ideological option in a way Syria could not with 1979 Iran. Considering that ideologically-guided policy would be defined by supporting democracy, it avoids the arbitrariness of dictators. The fears of democracy in Israel are more attributable to near-term developments, not long-term. For whatever difficulties Israel might see with the Palestinians, denying Arab aspirations for civil rights is neither pragmatic nor moral. A different approach, even just to stir up debate in the Middle East about relations with Israel, is beneficial to the Jewish state. Prime Minister Netanyahu is categorically wrong in his approach to the Egyptian protests, should never have agreed to military reinforcements’ deployment in Sharm el-Sheikh and risks manufacturing the very scenario the Israeli security establishment fears would result from an Egyptian revolution. The 1979 Iranian Revolution is, and no doubt should, shape Israeli and American policy as it is quickly drawn up and implemented vis a vis 2011 Egypt. Unfortunately, a neutral reaction on the part of the United States and a resistance on the part of the Israelis demonstrates that 1) the US would rather remove itself from the situation entirely and 2) the Israeli government sees a stronger hand of support for the allied regime is the best option for Israeli security. The Prime Minister’s comments alongside the German Chancellor demonstrate an inflexibility and paranoia lacking strategic forethought. While the American approach is more timid, the Israeli approach being applied by Bibi is far more dangerous and far more likely to backfire. The approach Israel might take ought to come out of the playbook of Hafez al-Assad in 1979. Assad congratulated and embraced the revolutionaries, becoming the most important asset for Iran in its efforts to fend off Saddam Hussein during the Iran-Iraq War. This seems to be, at the least, a counter-intuitive suggestion. Perhaps it even sounds alarming. However, a democratic Egypt does not have to jeopardize Israeli security Israel’s government, nor change the order of the modern Middle East. Ironically, the peace treaty between Israel and Egypt partially motivated Syria’s outreach to the new Iranian regime (the two events happened in the same year). It was Syria’s isolation in the Arab world in 1979 that convinced it seeking a new ally in an unlikely place would be to its benefit. Here too, there are some similarities. Israel faces regional isolation, thanks to pressure regarding the peace process and the fallout with Turkey, while Egypt’s next government would have to worry about its longstanding relationship with the Western World. Unlike Syria, Israel can offer more than just itself with a refreshed relationship, it can also offer the relationships of the United States and European Union. The unlikely union between Syria’s Baath Party and Iran’s Shiite Islamist Revolution demonstrates alliances of mutual benefit can be created in the most unlikely situations. Months later after the ratification of the new Iranian constitution, Assad repeated the gesture. Iraq’s, Saudi Arabia’s, Jordan’s and Egypt’s reactions were only cautious, perhaps foreshadowing the devastating Iran-Iraq War. Be it rhetorically, but all the more preferable in reality, Israel should embrace the path of democratization and publicly congratulate a new Egyptian government and the Egyptian body politic in its successful efforts to advocate nonviolent change. In turn, this could exert pressure on Hamas and Hizbullah while building further momentum for renewed democratic protests inside Iran. An Egyptian revolution in no way has to constitute the threat Iran’s 1979 revolution did. Indeed, it would be the paradigm for a 2011 revolution. In that, trading Mubarak for a revolution in Iran is far worth it. For anyone saying an Iranian revolution today would not matter as much if Egypt were to develop a hostile approach to Israel, they put way too much faith in the Muslim Brotherhood or xenophobia to take over Egypt. An array of other political forces, be they Christians or be they pragmatists, are just as likely to provide standing for a new government. A new Egypt does not have to jeopardize Israeli security in regards to Hamas or exert undue pressure on the Israelis to negotiate an unfavorable deal with Fatah. To the contrary, Egypt could utilize Israeli offers to help defend a new government against Syrian, Saudi or especially Iranian intelligence efforts to destabilize it. Israel’s lobbying efforts could make a new government’s establishment of relations with the Western world much smoother. The Jewish state can compensate Egypt for any losses it accrues as Nile Basin African states begin to utilize more of the river’s water via its desalinization technology. It may also invite Egypt to resume its mediating role with Palestinians and perhaps entice a moderated Muslim Brotherhood to persuade Hamas to finally abandon its policies of terrorism. Let a revolutionary new approach to Egypt characterize a broader strategic mindset on the part of Israel’s foreign ministry. A revitalized relationship with sub-Saharan African and Nile Basin countries would also balance out Israel’s ties with Egypt, or turning the Tunisian and Egyptian uprisings into lightning rods for Iranians. Most importantly, it could serve as the foundation for a new bloc of democratic countries in the region, especially if Iran teeters the way of representative and popular rule. Let the demonstrations in Egypt create an opportunity for Egyptians to openly debate the options of regarding its cold peace with Israel in a way that Mubarak never did. However unlikely these policies would produce positive results immediately, the next few years would likely bear fruit with their implementation. Despite whatever we are reading in relation to Avigdor Lieberman, Israel and Egypt have been working together like they never have before. Egypt has essentially sided with the Israelis in both of the country’s previous two wars, and has been indispensable in its anti-smuggling policies into Gaza. Considering the pressure Egypt is under, and its willingness to work with Israel in combating Hamas, the Israeli government needs to start implementing long-term policies that envision strong Israeli ties with the major countries in the Middle East. Egypt is a priority. Israel should be laying out brought goals regarding trade, increased security, and massive economic development in the Sinai Peninsula that would benefit both countries’ rapidly increasing populations demand for space. That will become an increasing priority over the next 100 years, with sea levels rising due to global warming and the predicted flooding of the Nile Delta region. In the meantime, Egypt is under intense pressure, evident in its confrontation with Avigdor Lieberman, to downgrade relations with Israel. No matter if Israeli firepower was too much in Gaza, it is perceived that way by Egyptians and other Arabs. The Israeli government needs to give the Egyptians immediate breathing room. Whether he likes it or not, Foreign Minister Lieberman should give into the demand he apologize to Hosni Mubarak for his comments last year. The Egyptians demand it, otherwise they’ll ignore him when dealing with Israeli diplomats. There is a cycle of stubbornness in Middle Eastern policy right now whose pressure ought to be alleviated – this would be a first step (and it doesn’t cost anything other than pride). I personally don’t like want Lieberman in the position he is in, but I’ll be practical and stick to recommending what to do with him rather than getting rid of him. Mubarak calling Netanyahu proves Egypt has no interest in being cold to the Israeli government. Mubarak wants to solve these problems, and he’d prefer to do it with the Israelis. Prime Minister Netanyahu will need to get the crossings into Gaza open at some point, and it should be done before a prisoner exchange. The public support for policy of arms in Gaza will dwindle after the crossings are opened, though that would probably take months. This will prevent any released Palestinian prisoners from being immediately sent back into battle. No matter what order the Israeli government sees as the most beneficial, the priority should be to help out Egypt diplomatically, and give countries (like Jordan) incentive to also warm back up any aspects of foreign relations between Israel that might have cooled over the last few months. Hosni Mubarak will not be around forever, like mentioned in several recent articles published on the 30th anniversary of the Israeli-Egyptian Peace Treaty. Perhaps his son or a similar politician to him will be his replacement, but inevitably the Islamic Brotherhood or other right-wing Egyptian parties will wiggle some power from the regime. If the layout for a post-Mubarak relationship is not presented, the cold peace with Egypt could deteriorate into something negligible. Israeli policy needs to accommodate the reality of Islamist regimes in its periphery. Intelligence experts, diplomats and public relations officials must be more familiar with Islamic legal principals in order to undermine so-called religious arguments by Islamist politicians and half-rate Islamic scholars. Given the global crisis facing Islam and its legal system, the Israeli government must be as well-connected with and knowledgeable about Islamic Law as it is about Jewish Law in order to solicit proper contacts in the Muslim World (not just Egypt). The fatwas issues by Palestinian clerics, declaring it a crime punishable by death to sell land to Jews, are the foundations for undermining Jewish rights to trade throughout the Middle East. This, if allowed to continue, will block any feasible peace from forming between Israelis and Arabs, preventing business contacts and the sale of property to Jews in all contexts – private or corporate. Without economic peace, there will be no peace. This does bring up how well the land laws are being applied in Jerusalem, but another Jewish perspective ought to be thrown into the mix. The Jewish right to own property, both in Jewish law and as should be recognized in international treaties, cannot be held hostage if Israel’s economy will inevitably expand to benefit both Jewish and non-Jewish citizens. Jewish Israelis who are devoted to the idea of settling Israel and reject the violent ideas of some nationalists, will be totally undermined if their argument for peaceable property acquisition is discredited by those further to the right. I mention these things because Israel will have an intense interest in helping Egypt develop the Sinai peninsula. Egypt’s population is nearing 80 million, well-beyond the point of residential comfort for Egyptians in the Nile Delta. Egypt will be looking to spread its population out along its underpopulated Sinai and Red Sea coastlines. It has the potential for major Israeli involvement in development projects, especially since any new development might be in conjunction with Israeli development in the Negev. But there is an even more urgent need for Egypt, considering global warming projections over the next century predict much of the Nile Delta will be flooded by the Mediterranean. Israel does not have the problems Egypt does, so it can afford to prioritizing helping its neighbor adjust to the rising tides. Israel can take advantage of the opportunity to build long awaited canals that will channel more water into Israel. There is room in the Negev and Sinai deserts to pool water, a potential joint project that would involve the growing Israeli Water Industry. When Prime Minister Menachem Begin and President Anwar Sadat made their peace agreement in 1979, Begin agreed to give over the entire Sinai Peninsula, and even accepted an $80 Million buy-out from the Egyptian government for the Jewish settlement of Yamit. Something similar happened with the Ofira settlement right outside Sharm el-Sheikh. The wake of the evacuation left a scar on Israeli-Egyptian relations at their birth. Egypt envisioned what the Israelis originally set out to do at Yamit: build a bustling port city. Instead, Egypt would have to rebuild the town if it wanted to achieve that, and the investment has apparently not been worth the time of planning and reconstruction. A general and mutual respect for legal systems will inevitably give Islamic governments a reason to accommodate economic ventures with Israel who are willing to spend millions to legitimately buy property from Palestinians (a strategy which would undermine the extreme right-wing in the Jewish camp).